Every fourth year (2002, 2006....) during September and October, the quiet banks of the Adams River 405km (251 miles) inland from the Pacific ocean, becomes the scene of a natural miracle. In these peaceful, colourful days of early fall, the normally quiet waters of the 12km (7.2 mile) river turn turbulent and crimson as over two million sockeye salmon - fish returning from a life's journey that takes them far out into the ocean - pour into their home waters to spawn and to die. And every four years, their arrival is welcomed by the "Salute to the Sockeye" a pageant which draws hundreds of thousands of visitors to the Roderick Haig-Brown Provincial Park, a section of the river dedicated to the famous British Columbia fly fisherman, naturalist and author. 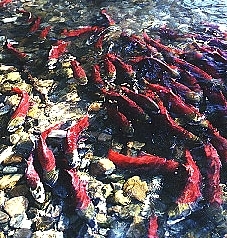 Sockeye salmon return to the Adams River every year. But the migration that occurs every fourth year dwarfs the others, reaching as high as 2.6 million million sockeye in 1990.